Greece, the birthplace of Democracy and home to some of the most stunning coasts in the world. It’s culture and past run like a main artery through the western world, and the sunshine seems to be unending. Mykonos, an island in the middle of islands, is no different. Surrounded by the bluest of waters and a way of life that only an island could create—Mykonos is a must-see for the traveler. That’s why Homeric Tours has sponsored our 60-Second Geography article for today. Their ways of getting you around Greece, and its islands, will take you to places that fulfill the ideal vacation. Mykonos, otherwise known as the Island of the Winds, is approximately 100 miles off the southeast coast of mainland Greece. It is surrounded by islands in the Aegean Archipelago. Close and far away at the same time, Mykonos has a different feel than the rest of Greece. The images of the capital city Mykonos Town, also called Chora, are full of cobbled streets and light-colored homes overlooking unforgettable coasts. Balconies are visible throughout the city, even above the labyrinth-like streets. During the day, there is sun shining on the entire island which gives clear views of beaches and trademark places. While the nights ramp up for the party and dancing to come. The name Island of the Winds is apropos for Mykonnos, as the breeze is nearly always blowing. This was the reason behind the construction of Mykonos’ windmills, which can be seen anywhere in Chora. These 16 white-washed windmills are iconic for their rounded design and placement around the harbor closest to Chora. The traveler can enjoy these from afar or visit one of the windmills that has been turned into a museum. There are also plenty of small churches, cafes, and restaurants for the traveler to stop by at any time. And the food is a fresh treat to be enjoyed on an outdoor patio with fantastic view of the city, smaller villages or coasts. Of course, a good amount of travelers need a beach while enjoying their time in Mykonos. Mykonos has plenty, and these 25 beaches can be as diverse as the travelers visiting. For the people who enjoy a good party, the aptly-named Paradise Beach will satisfy their need to go clubbing at the nearby Cavo Paradiso or enjoy the revelry on this white sand beach. Platys Gialos Beach, one of the more popular beaches, is wider than most with water that shines and a clearly visible bottom. While Fokos Beach is a more quiet affair, and a bit further out from Mykonos Town, and lets the traveler relax in serenity surrounded by the blue-clear waters and rocky cliffs. Beaches are an important part of most traveler’s plans, and Mykonos will not disappoint those plans. 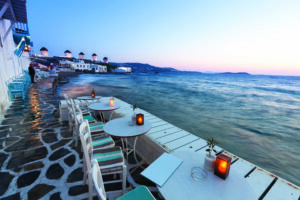 Mykonos is a place for both revelers and the relaxers. From the beaches to the iconic view of white-washed buildings, it is a complete vacation for the traveler. And Homeric enjoys setting up a great trip, whether it’s a cruise, a honeymoon, or group travel—Homeric wants to show travelers the best of Greece. The Island of the Winds awaits the traveler with many options in a paradise setting. Wander the cobblestone streets of the Plaka (old city) in Athens, peruse the shops or dine on authentic Greek cuisine in one of the many Greek tavernas. Take an afternoon scenic drive along the coast with a tour to Cape Sounion, dominated by the spectacular Temple of Poseidon, first mentioned in the Odyssey, overlooking the Aegean Sea. Set sail on a seven-day cruise morning arrival in Izmir, the second largest port in Turkey, also known as Smyrna. Drive to ancient Ephesus and visit one of the world’s largest open air archaeological museums. Your adventure continues as you explore the Greek islands of Crete, Santorini, Milos and Mykonos. Extend you summer and embark on this magnificent Aegean Adventure. Whether you are exploring the ancient archeological sites in Athens or dancing the night away on Mykonos, you can be sure that Greece has a wonderful experience made just for you. Sail along the Bosphorus Strait which divides two continents. You will see the Orient and Occident emerging. You will visit the city of Cannakale where you can admire the storied wooden Trojan horse. After that sail on to the beautiful city of Volos and then on to Crete where you can take and excursion to the Palace of King Minos at Knossos, the center of the Minoan civilization. All this while sailing on the blue Aegean Sea on your 7 day cruise. Explore Athens and enjoy the old and new classics. Take a tour of the city including the world famous Acropolis and Panathenaikon Stadium, the place of the first modern Olympic Games. Sail away on a three-day cruise with stunning ports of calls like Mykonos, home to celebrities and jet setters, Kusadasi, gateway to the ancient city of Ephesus and Patmos, where you can visit the Monastery of St. John, which holds a priceless treasure of icons, illuminated manuscripts and vestments adorned with precious stones. Then on to Crete, home to the Palace of King Minos and the myth of the Minotaur, and the romantic island of Santorini, featuring incredible sunsets and panoramic views. A wonderful way to see the highlights of the Greek Islands in a short amount of time. Have your own Odyssey in the land of Homer. © Copyright 2019 Travmarket. LLC.